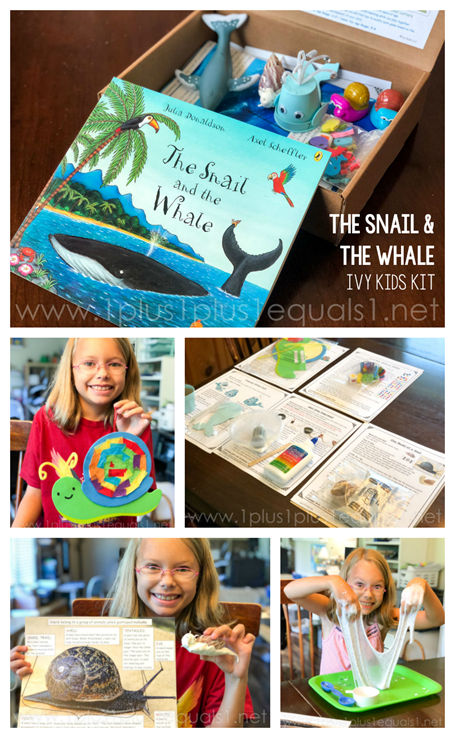 We were sent The Snail and the Whale kit for this review! 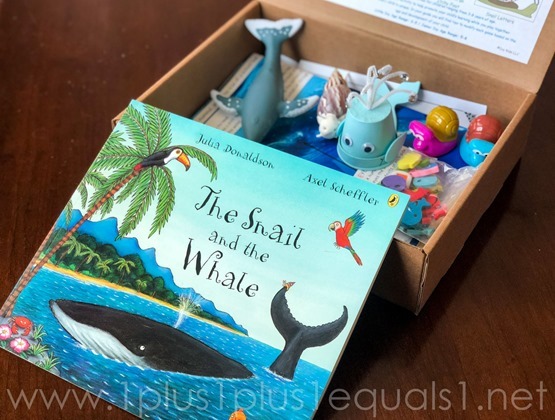 The book The Snail and the Whale by Julia Donaldson is an adventure-filled story about the friendship between a snail and a whale. 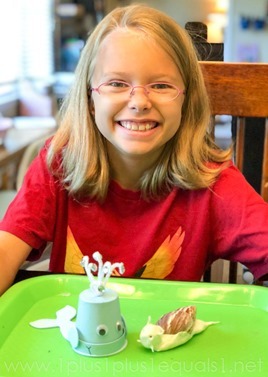 Humpback Whale Toy: Explore the whale toy and learn interesting facts about the humpback whale. 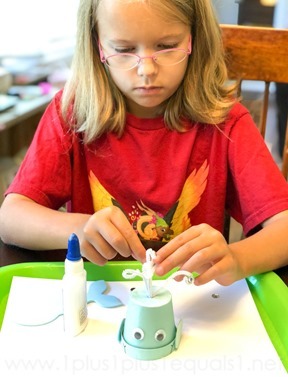 Flowerpot Whale Craft: Create a whale using a flowerpot and accessories. 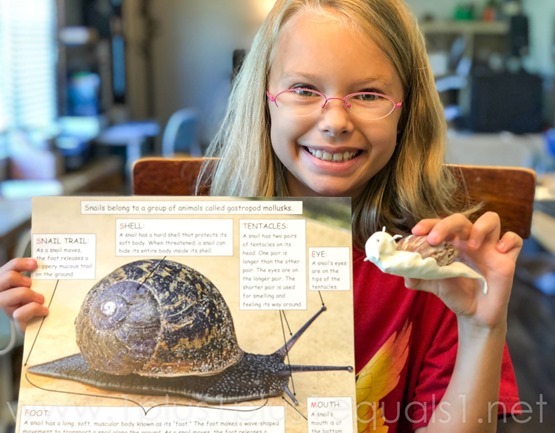 Clay Model of a Snail: Use the clay and shell to form the snail’s body. 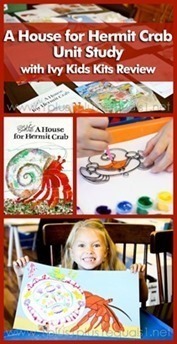 Then use your snail for imaginative play and/or to retell the story. 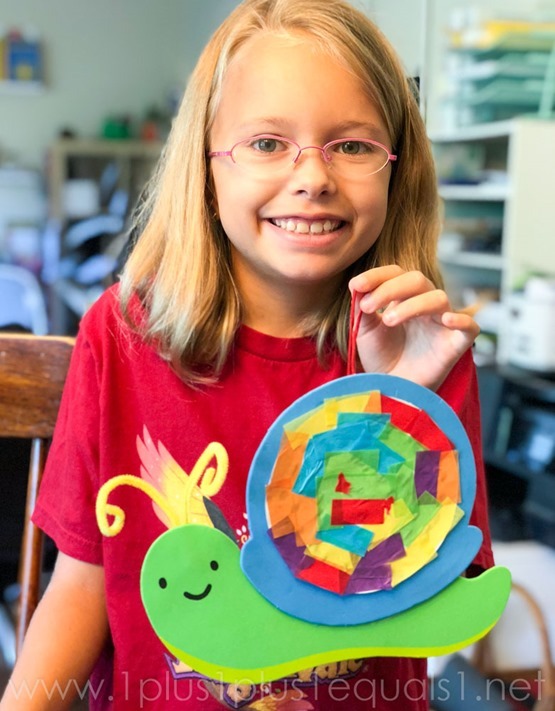 Snail Collage: Assemble the snail and create a collage on the shell with the colorful tissue squares. Snail Trail: Use the silver glitter glue to create a sparkly message or design, just like the snail in the story. 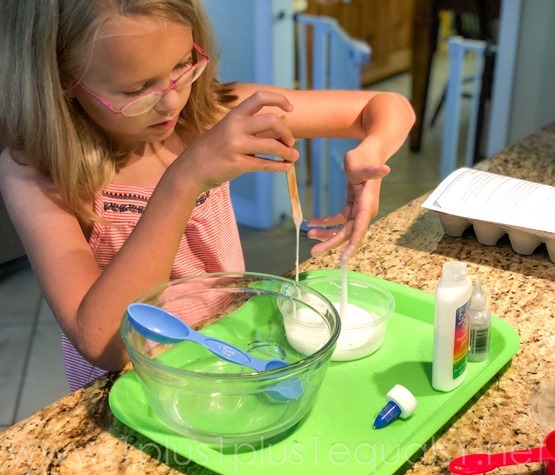 Snail Slime Experiment: Use the ingredients provided to create your own snail slime. 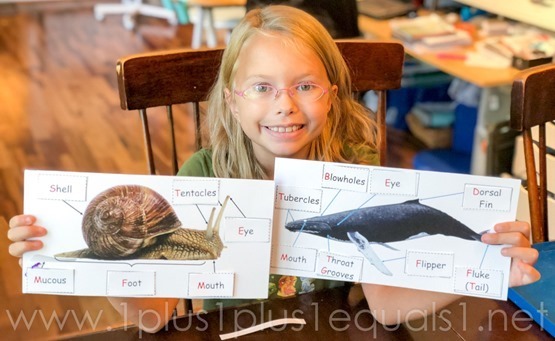 Whale and Snail Body Parts: Learn interesting facts about snails and whales. Then label each animal’s body parts. Snail Race: The snails are trying to get from the rock to the whale’s tail. Which snail will be first to reach the tail? 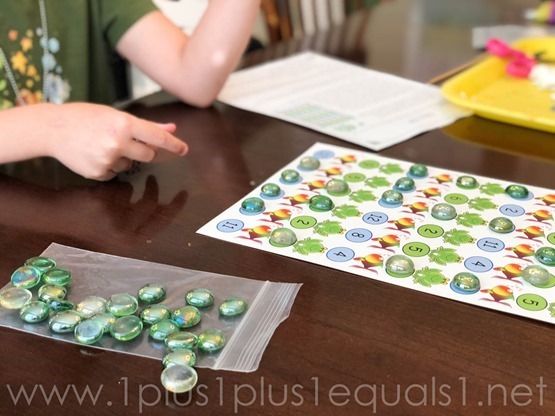 4 in a Row: Snails vs. Whales: In this version of 4 in a Row, one player will be the “snails” and one player will be the “whales.” To win, you must cover 4 spaces in a row. There are 4 different boards to choose from. 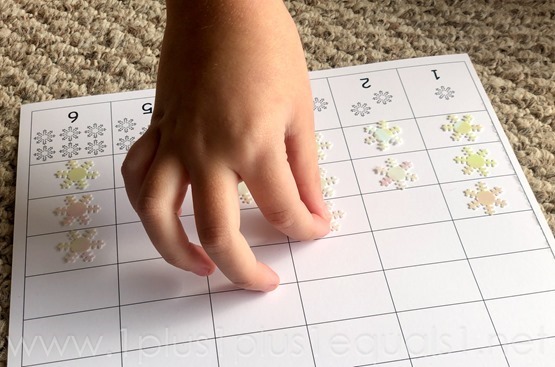 Snail and Whale Patterns: Use the snails and whales to create and continue the pattern in each row. Snail Letters: Roll your dice and move your pawn around the letter path on the shell. When a player lands on a space, identify the letter or name of a word beginning with that letter. Snail with an Itchy Foot: Pretend your snail wants to explore the world. Place your snail racer next to the “zero” card, pull it backwards, then let it go. See how far your snail can go. If I Were a Snail…: Pretend that you are the snail with the itchy foot. Then think about where you would want the whale to take you and why you would want to go there. Find the Rhymes: Players take turns flipping over 2 cards at time, trying to find words that rhyme. Collect the most pairs to win the game. 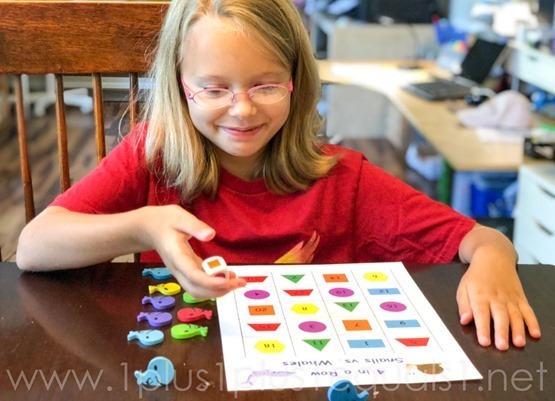 Snail and Whale Number Stories: Create your own number stories using the snail and whale pieces. 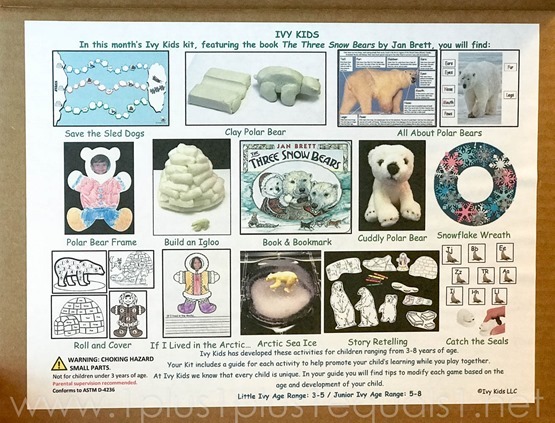 I love how organized the kits are, it is so easy to open the box and pull out the instructions and materials for each activity. Sometimes I will pull several out like this and let her choose what she wants to do. 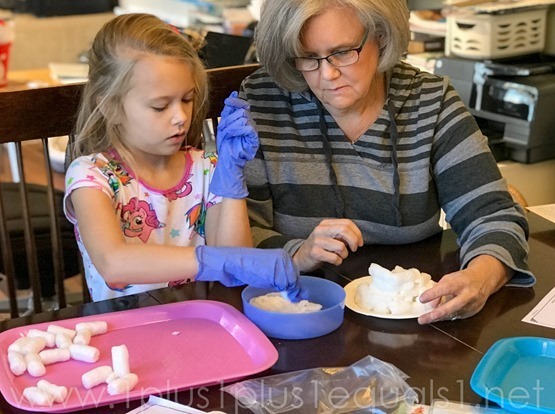 Making slime is always a favorite! 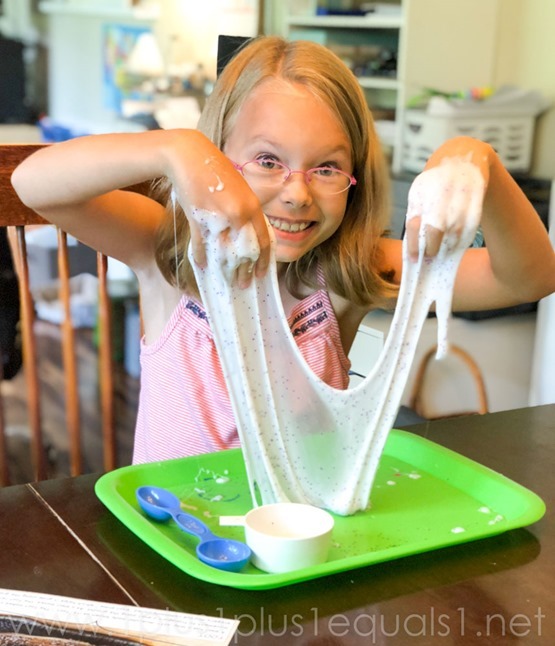 We never got into the slime-making trend so for her this was an awesome experience! 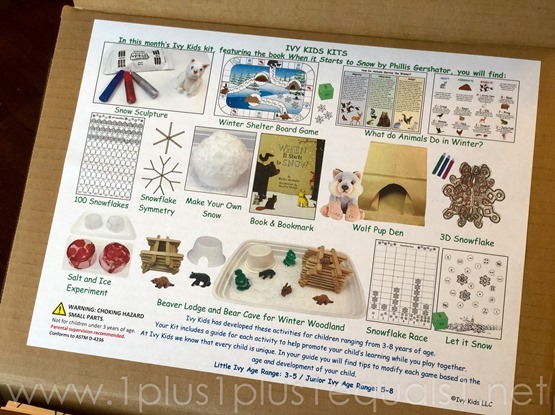 These kits are great for grandparents to do with their grandkids! My mom loves coming over and having activities already planned out for her to do with my daughter. They made the crafts together and learned all about the snail and the whale! 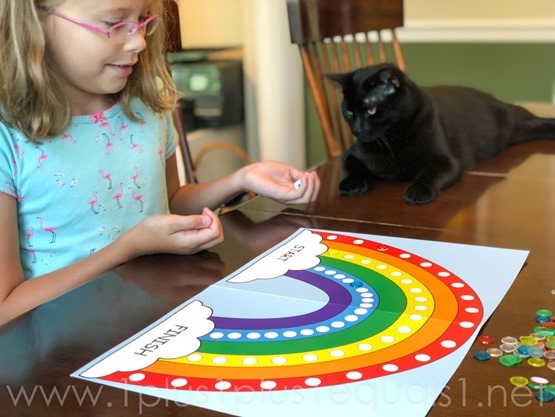 As always, she loves the games included with each kit. 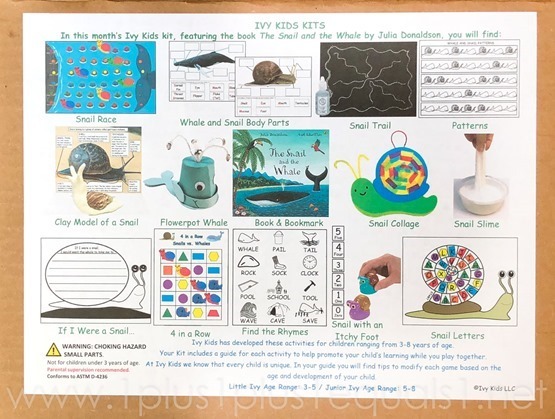 This kit was especially fun with the little snail/whale pieces to play with. Below you can see her playing the Snails vs. Whales game. 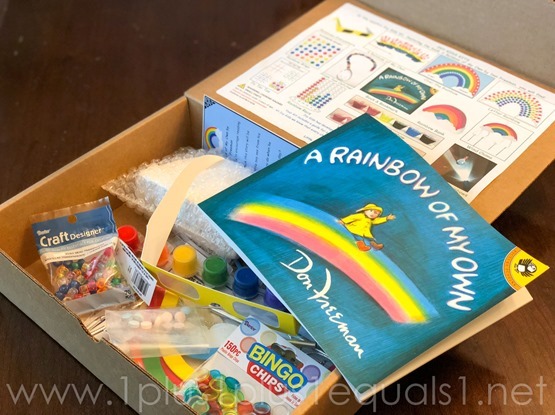 Enter to WIN this kit using Rafflecopter below! 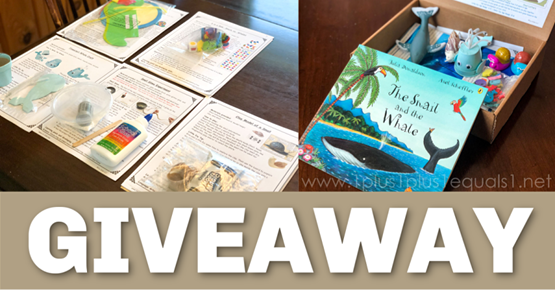 Giveaway is open to US residents only, and ends September 14, 2018. 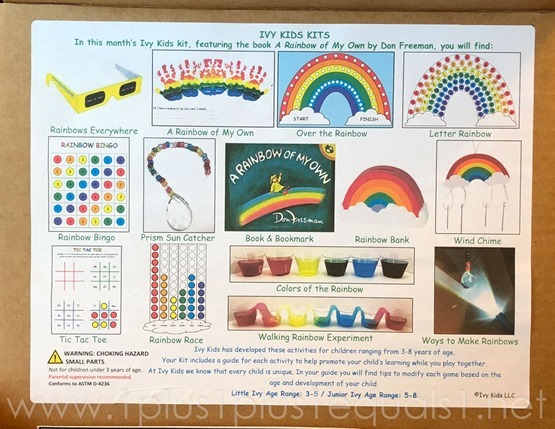 We were sent the A Rainbow of My Own kit for this review! 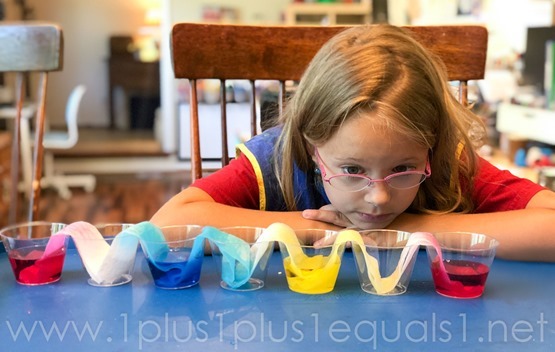 Her VERY favorite activity was the walking rainbow experiment! We were all fascinated by this, and left it up for a day so we could watch the colors become even more intense! We have really enjoyed making rainbows on our wall with this awesome prism craft that now hangs in our window! As always, she loves the games included with each kit. 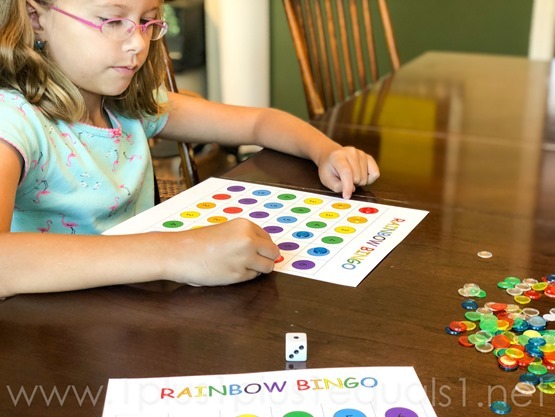 We played BINGO, Tic-Tac-Toe, Rainbow Race and Over the Rainbow. I keep wondering when she will think she is too old for these games, but it hasn’t happened yet and I am fine with that!! We were sent the Fish is Fish kit for this review! 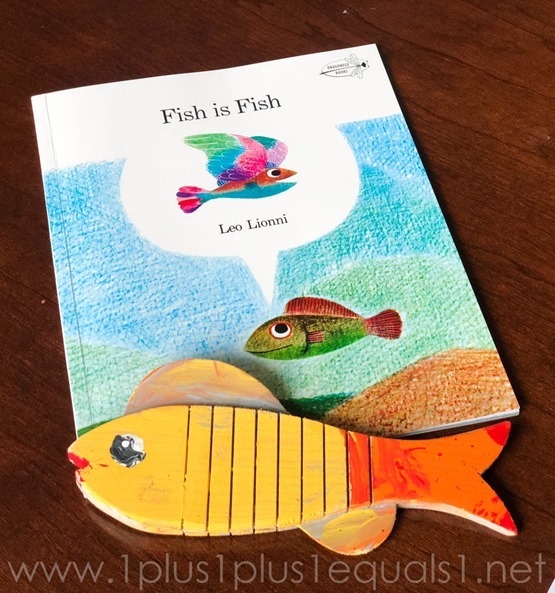 The book Fish is Fish by Leo Lionni: A sweet story about two best friends, a fish and a tadpole that are inseparable until the tadpole starts to change into a frog. 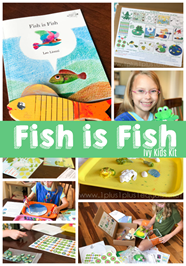 Fish is Fish: Paint the flexible wooden fish then use it for pretend play or as a decoration. 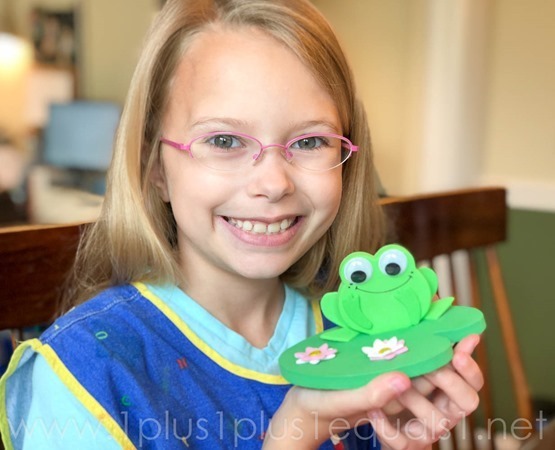 Frog on a Lily Pad Craft: Assemble the foam pieces to create a frog on a lily pad. Then place the lily pad on some water and watch it float. 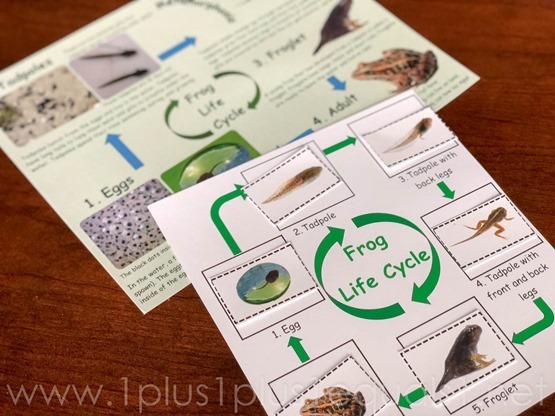 Frog Life Cycle: Explore realistic figures to learn about the life cycle of a frog. 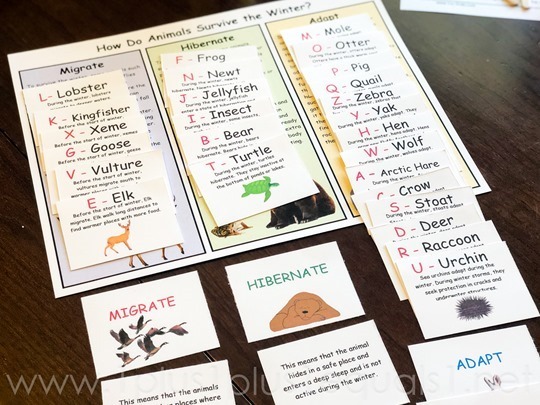 Then cut out the cards on the board and sequence the difference stages of the life cycle. 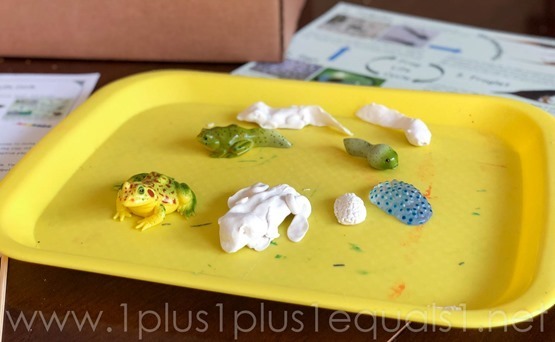 Clay Model of the Frog Life Cycle: After learning about the life cycle of a frog, use the clay to make models of the different stages of the life cycle: eggs, tadpole, froglet, and adult frog. After the clay has air dried paint the different clay figures. Frog and Fish Pond: Create your ponds by painting the white cardboard circle with water, land, plants, rocks etc. Once the paint has dried, you can add the frog and fish figures to the pond. 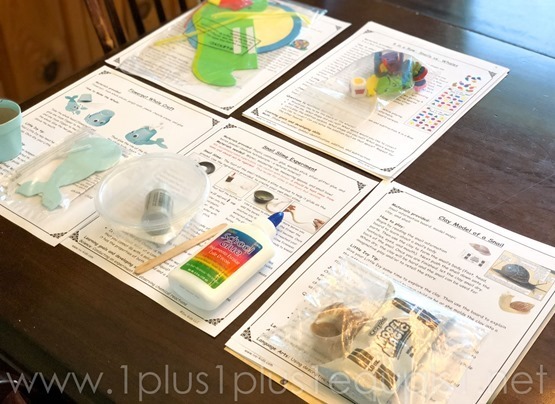 You can also add the clay figures you made from the “Clay Model of the Frog Life Cycle” activity. 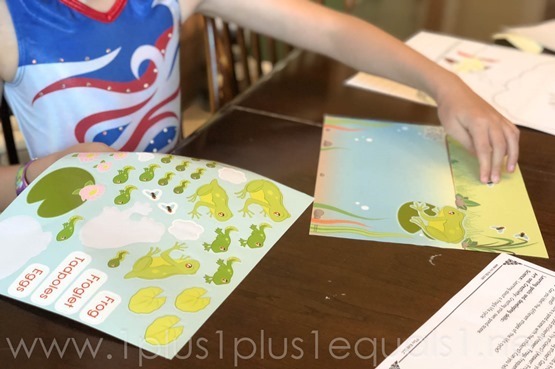 Frog Life Cycle Sticker Scene: Decorate a pond with stickers to show all the different stages of the frog life cycle. 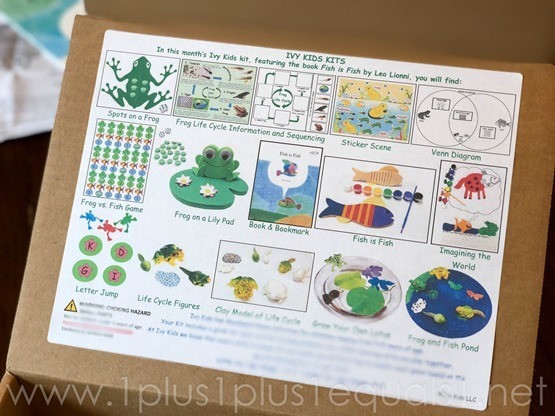 The stickers include frogs, froglets, tadpoles, eggs, lily pads, and flies. The stickers are repositionable to allow for children to create different pond scenes. Grow Your Own Lily Pads with Lotus Seeds: Lotuses are plants that grow in ponds. The leaf of the lotus plant floats at the top of the water and the flower rises above the water. Simply drop the seeds in the bowl and add water. Within 2 weeks, roots and sprouts will emerge. For extra fun, add a toy frog and/or fish to the bowl to create a mini pond. Frog and Fish Life Cycles: Learn fun and interesting facts about the life cycles of fish and frogs. 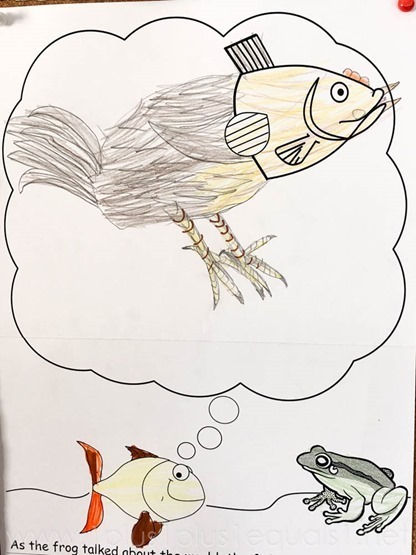 Frog and Fish Venn Diagram: In the story, we learn that there are similarities and differences between fish and frogs. 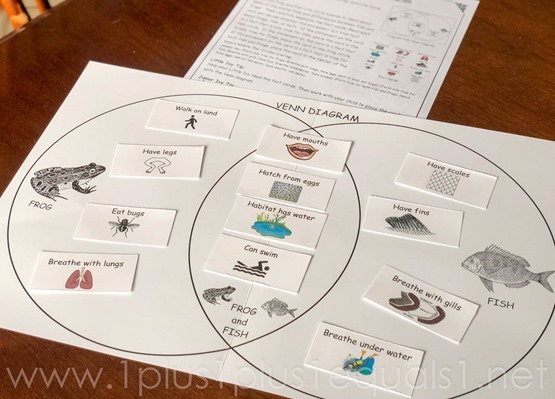 Use a Venn diagram to sort fact cards about fish and frogs. What facts to fish and frogs have in common? Imagining the World: In the story, the fish imagines what animals and people in the outside world look like. Paint a picture of what the fish imagines in its mind about the outside world, then write about your idea. Letter Jump – Letters: Where will the frog land? 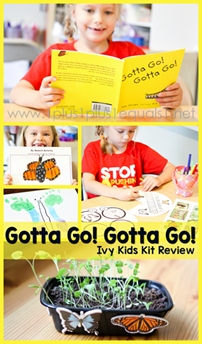 Push down on the tail of the frog to make the frog jump on to a letter lily pad. Then identify the letter, letter sound, and/or word that begins with that letter. 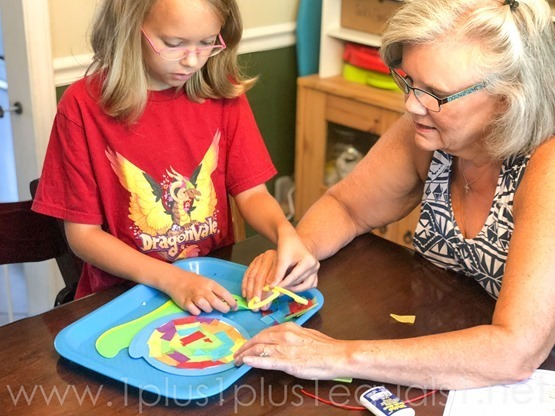 Letter Jump – Reading: Line the cards up to form a word. Have your child move the frog from lily pad to lily pad to sound out the word. Frog vs. Fish: One player will be the fish and one player will be the frog. Players take turn rolling the dice and cover corresponding number spaces on the board. The first player to cover all 6 spaces in one of his or her rows wins the game. Spots on a Frog: Roll the dice and place that number of green gems on the frog. Older players can determine whether that number of spots on a frog would be odd or even. 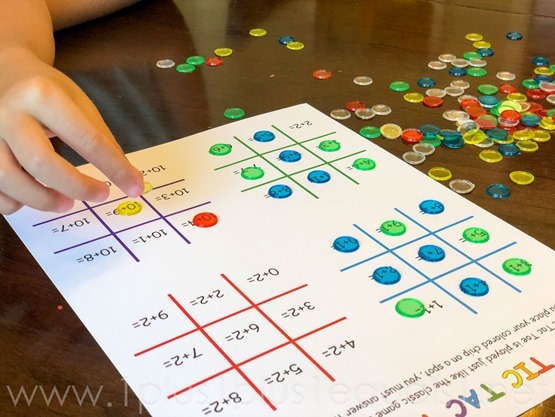 Younger players can just play this as a simple counting game. 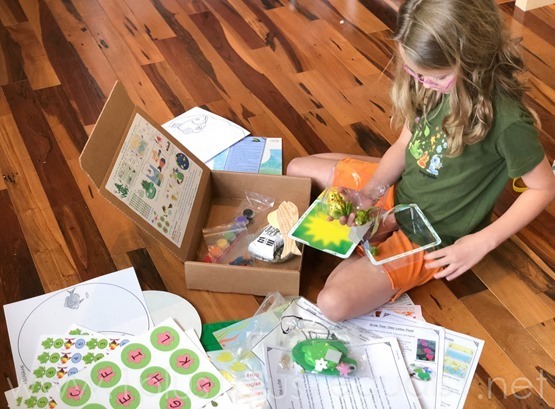 This was a very fun box, filled with many activities focusing on the life cycle of a fish and a frog. My daughter loves animals so this was a perfect fit! 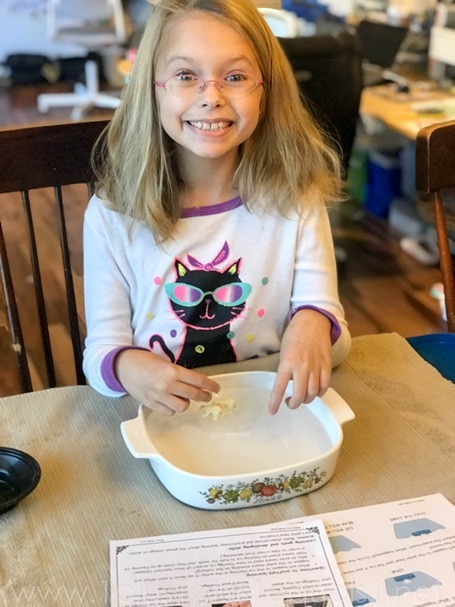 She absolutely loved making her own model of the life cycle set that came with the kit. Stickers are a big hit with her also, so the sticker scene was fun too! Creating her own pond, was one of her favorites from this box. 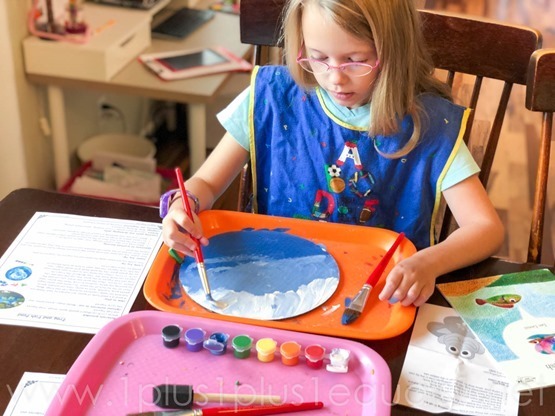 She is very artistic and put a lot of thought into this activity. 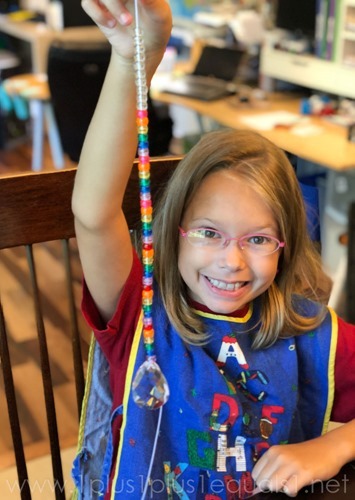 Crafts are always enjoyed by my daughter! 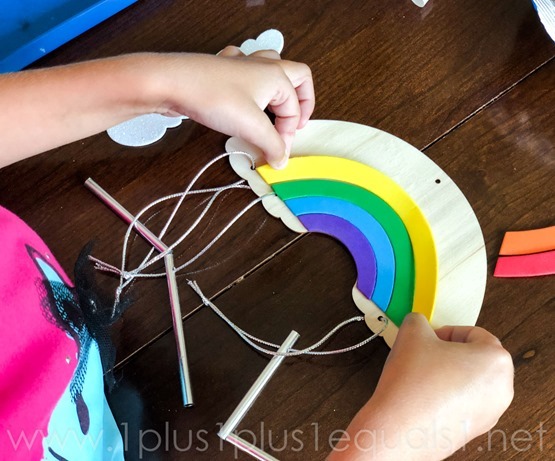 She loved the wooden fish included with the kit, it wiggles! The foam frog craft is adorable! Her creativity popped with the writing/drawing activity. We recently got chickens, so of course her fish dreamed of being a chicken! She always enjoys the games, I think it’s the quality time aspect of them. She loves interacting and spending quality time with people she loves, so the games are perfect for this! 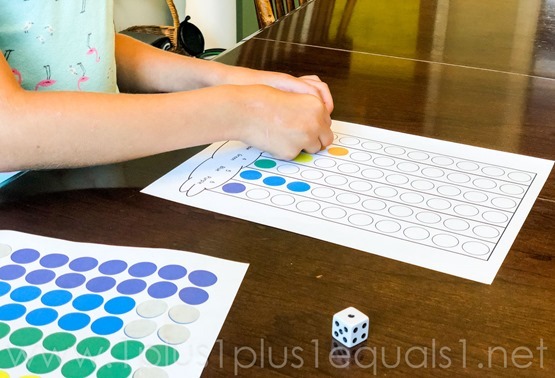 This was a fun game, allowing her to review her basic addition facts – never too old for that! The Venn diagram was a great review of this concept! 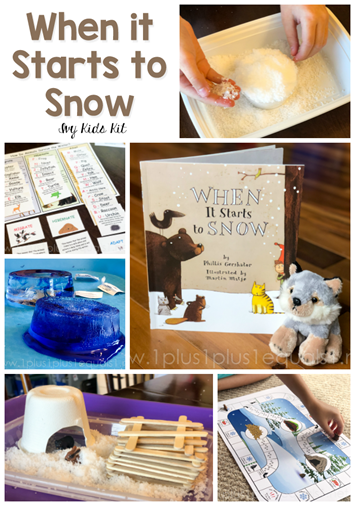 We were sent The Three Snow Bears kit for this review! 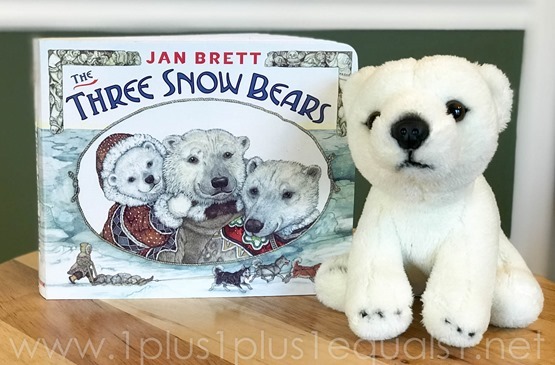 The book The Three Snow Bears by Jan Brett, a story about a girl that meets a polar bear family. 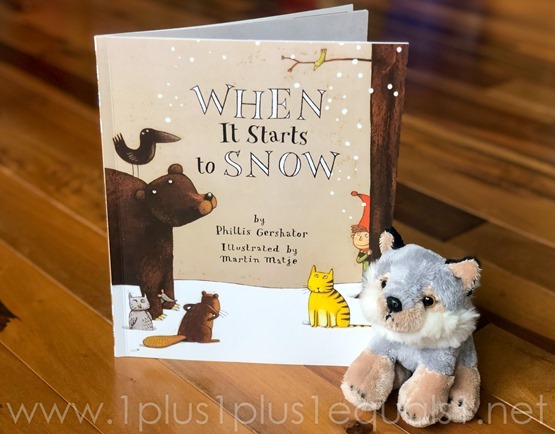 This books gives readers a glimpse into life in the Arctic. 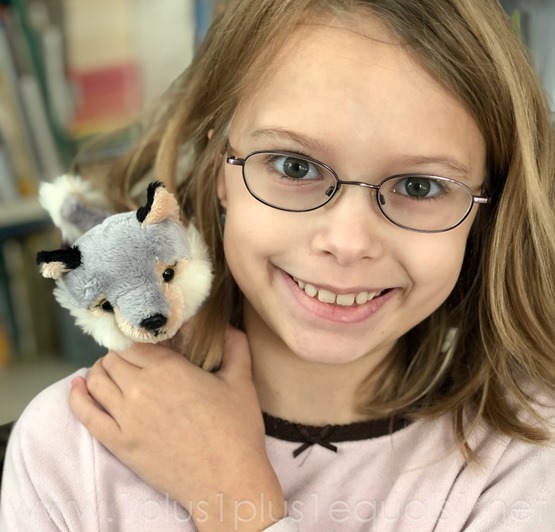 Plush Polar Bear: This cuddly polar bear is the perfect companion while reading the story. Build an Igloo: Learn how people in the Arctic use ice blocks to build igloos. 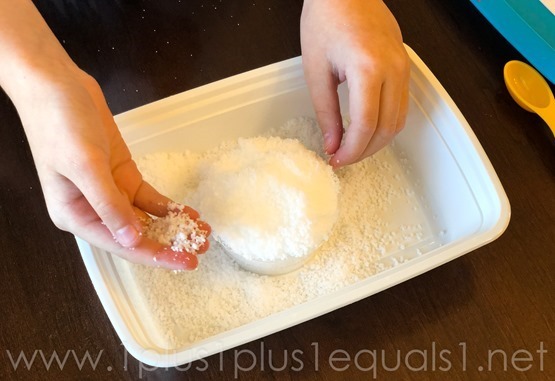 Then use "ice blocks" (made from biodegradable corn starch) to build your own igloo. 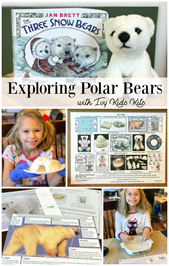 Clay Polar Bear: Learn fun and interesting facts about polar bears. 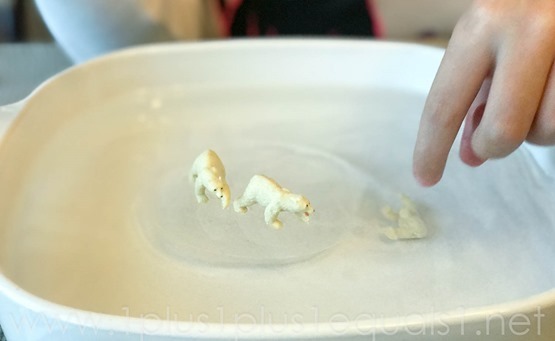 Then use the white clay to create your own polar bear. 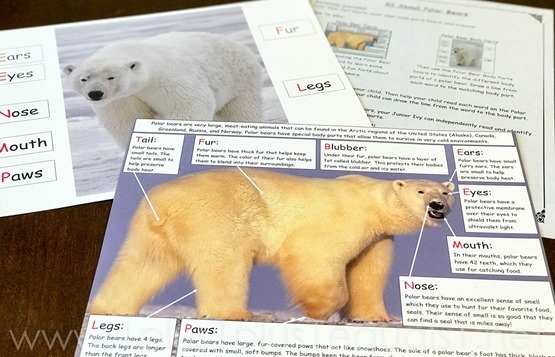 All About Polar Bears: Identify the different body parts of a polar bear. 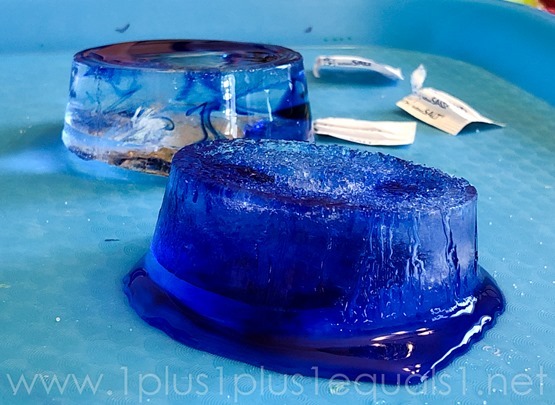 Arctic Sea Ice Experiment: Use the bowl provided, water, and your freezer to create an iceberg floating in the Arctic sea. 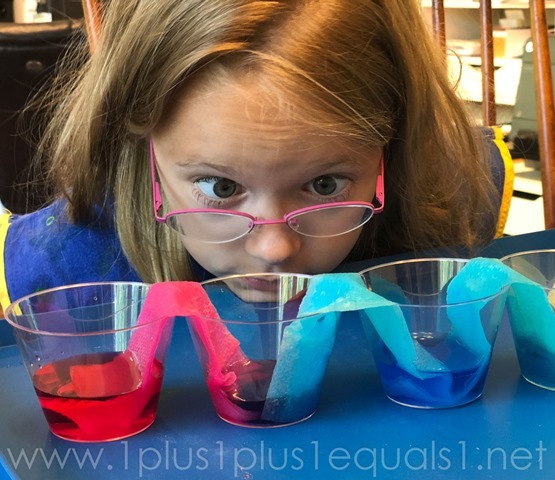 Explore how ice acts in water and how polar bears use the ice. Polar Bear Frame: Select a photo and add it to the frame. 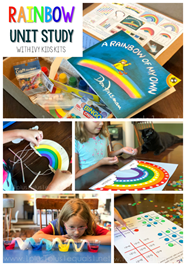 Pretend to be one of the bears from the story and use the crayons to draw clothes onto the bear frame. 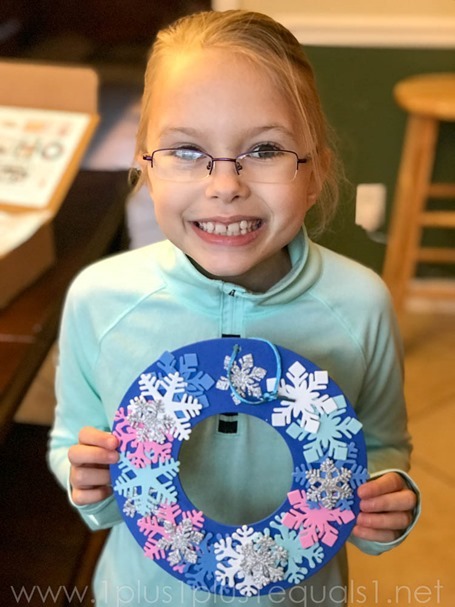 Snowflake Wreath: Use lots of snowflake stickers to create beautiful winter wreath for your home. 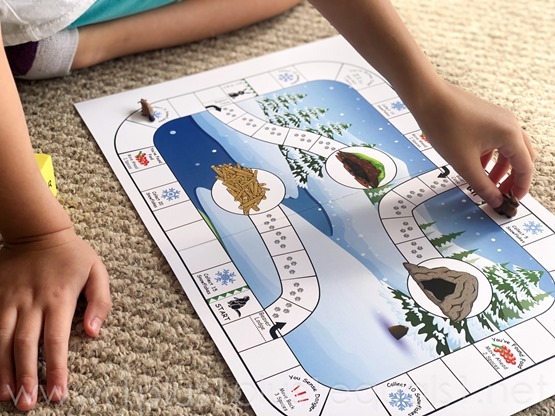 Save the Sled Dogs Board Game: Roll the die and move your polar bear on the iceberg path. The first polar bear to reach the sled dogs wins the game. Catch the Seals: Pull-back the polar bear and watch it go. If the polar bear lands on or touches a seal card, the player collects it, identifies the letter(s) on the card and names something that starts with that letter sound. Roll and Cover Game: Select one of the fours boards provided. 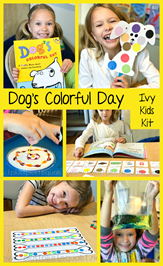 Then roll the die, find the number on the board and cover it with a white pom-pom. Cover all the spaces to win the game. If I lived in the Arctic: Think about what life must be like living in the Arctic. Write your ideas on the space provided on the board. Then use the crayons to color a picture of yourself dressed as though you lived in the Arctic. 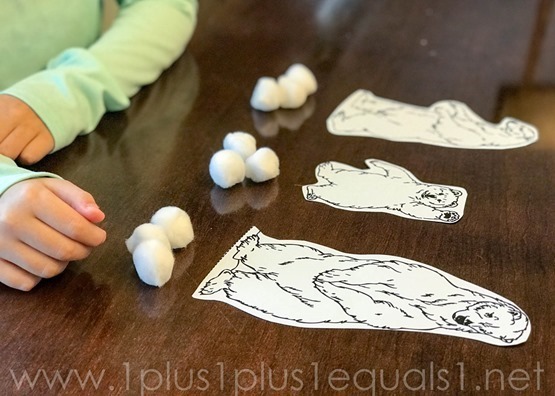 The Three Snow Bears Story Retelling: Color and cut out the characters from the story The Three Snow Bears. Then reread the story and use the characters to act out the story. 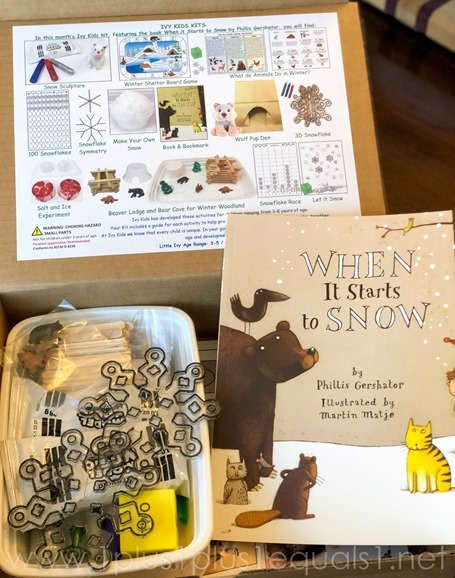 Number Stories: Create your own number stories using the characters from the story The Three Snow Bears. If Papa bear has 3 snowballs and Baby bear has 2 snowballs, how many snowballs do they have altogether? 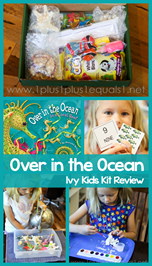 Her VERY favorite activity from this box was the Arctic Sea science experiment! 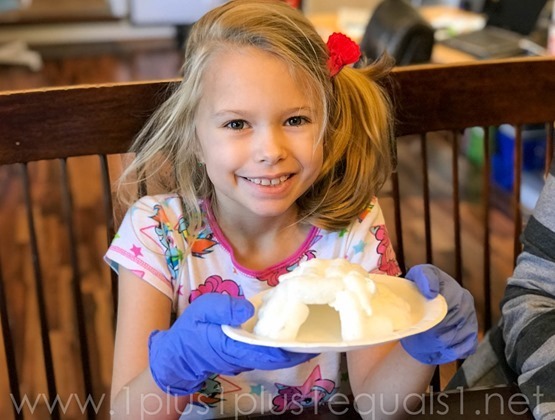 She loved creating her own iceberg and investigating how polar bears interact with the icebergs. She played with this for so long after the actual lesson and has since frozen water to have some of her other toys go ice skating. 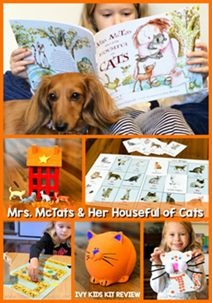 My mom absolutely loves these kits and they will often do the crafts and messy activities together when she comes over. I love having things specifically for them to do together! 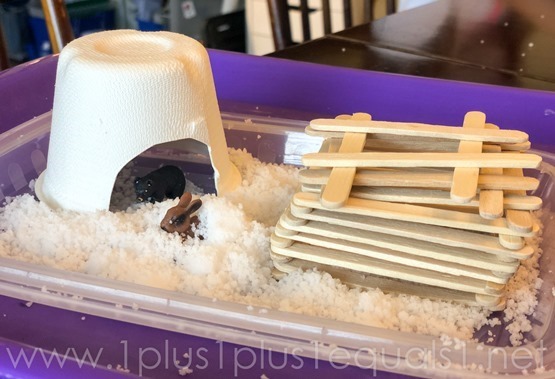 They studied igloos and made one together. She couldn’t stand the sticky feeling so she asked to wear gloves! Another simple but fun craft! We used the math activity in the box to work on division word stories instead of addition and subtraction. Not everything from this kit is pictured, she enjoyed more of it and is still enjoying some of it! One thing I didn’t grab a photo of that I wish I had was her clay polar bear! 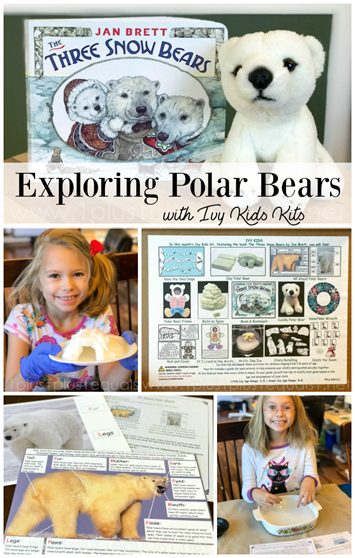 She and my mom both made polar bears and they looked like cats, they were hilarious! 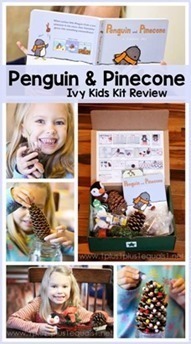 We also loved our A House for Hermit Crab kit, Penguin & Pinecone kit, Gotta Go! Gotta Go! kit, Over in the Ocean, Dog’s Colorful Day, Are You a Ladybug?, and Mrs. McTats and Her Houseful of Cats!